The question remains: can Bolger salvage his reputation? It got us thinking back to the 1989 Keating Five scandal. Charles Keating owned a savings and loan and made substantial political donations to U.S. Senators Alan Cranston, Dennis DeConcini, John Glenn, John McCain and Michigan’s own Don Riegle. Those Senators then called off federal regulators investigating Keatings’s operation – which went belly up and cost taxpayers billions. The scandal ended the career of Sen. Don Riegle and three others. But not John McCain. He embraced reform. McCain became one of the sponsors of bipartisan McCain-Fiengold – Russ Fiengold was a Democrat – which created limits on political donations. McCain successfully jujitsued his scandal and became known as one of the fiercest advocates for cleaning up campaign finance. One wonders if we might soon see some bipartisan in Lansing. Could Democrats and Republicans come together and compromise on an election reform package? It’s certainly not an easy question to answer. A lot would likely have to change. Is all this really about showing the public that they've got their act together and want to restore confidence in the House and House leadership? Or, is this really about making the other guys look less-than-sincere about cleaning up the state's election laws? Furthermore, Rep. Bolger has made no secret of the fact that his hobby and his passion is crushing Democrats. And, Democrats are certainly enjoying watching their nemesis squirm. State Representative Roy Schmidt was back in the headlines this week; tagged in a prosecutor’s report as a liar and a cheat – but not a lawbreaker – for his last-minute party switch from Democrat to Republican and scheme to pay a patsy to be the fake Democrat on the ballot against him. It was just two short months ago that Schmidt was welcomed to the House Republican caucus with cheers and applause when he announced his party-switch. State House Speaker Jase Bolger was credited with engineering the political coup of the year. In fact, it was the first party switch by a sitting Michigan lawmaker in two decades. But, as it turns out, it wasn’t such a well-planned operation. This week, Kent County Prosecutor William Forsyth issued an eight-page report outlining the plot between Bolger and Schmidt. The report shows not only a plot for Schmidt to switch parties so late in the game that Democrats would not have time to put one of their own on the ballot, but also to pay one Matt Mojzak, a 22-year-old Schmidt-family friend, to be his fake Democratic opponent. Mojzak’s fee was to be $450. It was then upped to a thousand dollars as he started to get cold feet. Checks were cut from Schmidt’s campaign fund, but never handed over as Mojzak said he wanted nothing more to do with Schmidt or the scheme. The Republican prosecutor said Schmidt and Bolger tried to undermine the integrity of the election and that it was shameful but, not illegal. Apparently, paying someone to be on a ballot – to basically fix a political race – is not a crime in Michigan. The scathing report was made possible because Forsyth was able to trace back the scheme to text messages that were sent between Bolger and Schmidt. Yes, folks, another text-message scandal. 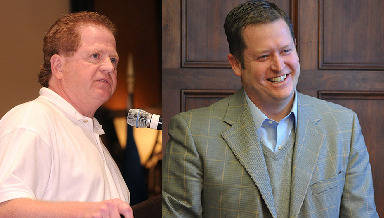 Political-observers from around the state have been making light of the texts between Bolger and Schmidt. Though they're certainly not as steamy as the infamous Kwame Kilpatrick-texts, they do seem to show a budding "bromance" between Schmidt and Bolger. You can hear a couple of the texts (yes, for your enjoyment, we did a reenactment) at the audio link above.